The 1990s may not seem so long ago, but in terms of house decor it’s an eternity, as Tamsin Mascetti of Tamsin Design Group can attest. Tamsin encountered a walk back in time with the recent redesign of client Christine Shore’s master bath. The home had undergone a refresh to most rooms, but the bathroom remained 220 square feet of anachronistic dysfunction. The interior design equivalent of the plaid flannel shirt, distressed jeans and Birkenstocks. 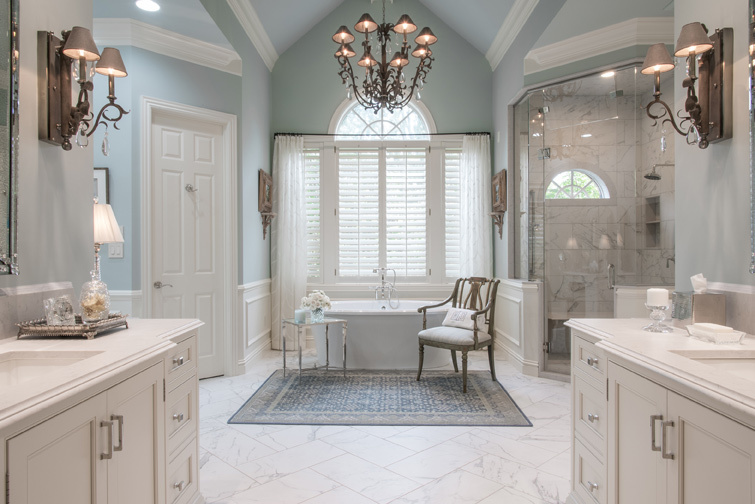 After a dozen or so years in her St. Louis home, Dawn Weinhardt, co-owner of Weinhardt Party Rentals, was ready to freshen up around the house, starting with an outdated master bath. A head-to-toe makeover in the summer of 2017 took the room from dim and dull to bright black and white. It’s now a modern gray-tone bathroom with a mix of just enough femme frill and mild machismo to make the space a haven for just about anyone seeking a quiet retreat.